Product prices and availability are accurate as of 2019-04-22 23:52:29 UTC and are subject to change. Any price and availability information displayed on http://www.amazon.com/ at the time of purchase will apply to the purchase of this product. 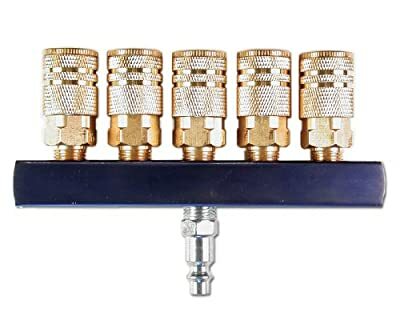 The prime fit M14025-7 5-way round air manifold is a splitter that features (5) 1/4-inch industrial style output couplers and a 1/4-inch quick connect input plug. This manifold easily splits air lines into (5) separate lines and has durable lightweight aluminum construction. The couplers feature a 6-ball bearing contractor-grade design for long life and corrosion resistance. The prime fit M14025-7 5-way round air manifold comes with a 1-year limited warranty. PRIME fit inc. And its affiliated companies have been one of the leading global manufacturers of pneumatic tools, air accessories and air hoses since 1976. PRIME fit produces a broad range of industry leading products serving the consumer, automotive, commercial and jobsite pneumatic markets.